Syos is the future of mouthpiece manufacturing for years to come! Before, the expense of having a custom mouthpiece seemed impossible, but now they give you the ability to choose exactly what sound you want and an awesome design! For example my design gives me the ability to reach the lowest octave easily and perform throughout my entire range without any trouble, and the colors are eye-gazing. I’m glad to be a part of the family! I hope you join as well! Geovany Chavez is a Mexican American self taught musician, recording artist, producer, social media influencer, and performer. Born in Downey, California he was introduced to music performance at the age of 6. 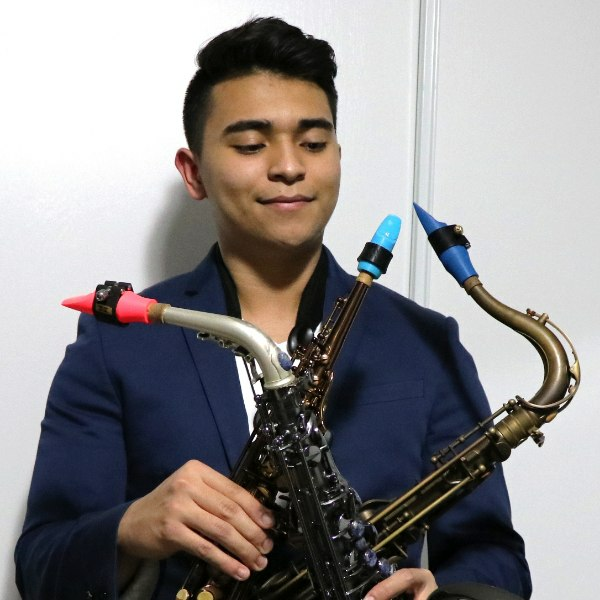 As a first generation musician Geovany found influence in music through smooth jazz from Kenny G, newer genre artists in EDM, funk from Bruno Mars, rap from Drake, and more. After high school Geovany focused on gaining recognition through a large social media platform of artists, musicians, and students. Through his captivating work, Geovany became well known for his Instagram: @geo.vany; with well over 12K followers. His media is filled with cover songs, music content, and music tips to help younger musicians. Through the use of social media he has been able to collaborate with other saxophone artists, interviewed on Telemundo, perform in private venues/events, and play as a guest artist for Los Angeles Fashion Week. Geovany is determined to help the music industry grow by targeting younger audience. He aims to modernize music with the use of his saxophone, and ultimately incorporate his saxophone playing into EDM music. Additionally, he hopes to one day release his own album, collaborate work with well known artists, and passionately keep influencing individuals through his media. As one of the youngest endorsers for Syos he aims to target younger musicians to help further grow this brand.